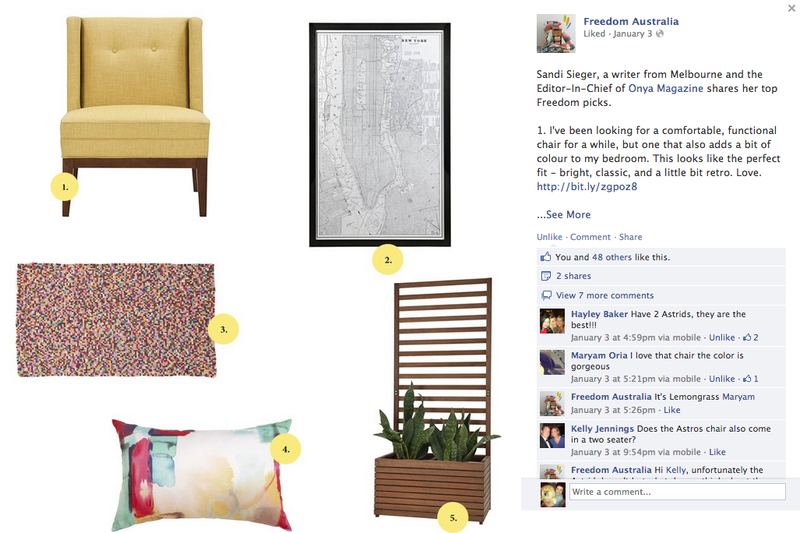 Earlier this month, the folks at Freedom Australia asked me to share a few of my favourite picks from their current collection on their Facebook Page. And so I thought I’d share them with you, as well – because who doesn’t love pretty home wares? Sandi Sieger, a writer from Melbourne and the Editor-In-Chief of Onya Magazine shares her top Freedom picks. ← Oh, looksy, it’s me! I love that chair too! I’ve been eyeing it ever since it came out for my reading nook. Congrats on the baby how exciting! The chair would be perfect for a reading nook!